The 1965 Shelby Mustang started life as a stripped down 1965 Ford Mustang fastback "K" code (high performance 271 horsepower 289 cubic inch V8) cars equipped with a 4 speed transmission. From this base, Shelby and crew used their racing and tuning expertise, turning them into formidable race track and street winning cars. Unlike many factory sport packages, this was no simple cosmetic alteration. Combining good old hot rod techniques with lessons learned on the track and in his Shelby Cobra, the little pony car was turned into a stallion. The 1965 Shelby Mustang GT350 was the result and is still one of the most sought after Mustangs ever. Some say it's one of the best looking 1965 Ford Mustang derivatives as well. If you are considering buying a restored GT350 or for that matter, a 1965 Mustang fastback, you can expect that your car will have been produced late in the 1965 model year since only the coupe and convertibles were produced initially. In the case of the Shelby GT350, the very first units were converted in California during November 1964. When you look at the exterior of the 65 Shelby GT350, you'll see some significant styling changes when compared to the standard 1965 Ford Mustang fastback (also known as a 2+2). The new concept was the brainchild of none other than Carroll Shelby, father of the ferocious Shelby Cobra whose facility received brand new 1965 "body in white" 1965 Ford Mustang fastbacks which included the high revving and exciting 271 horsepower 289 cubic inch V8 commonly known as a "K Code engine". 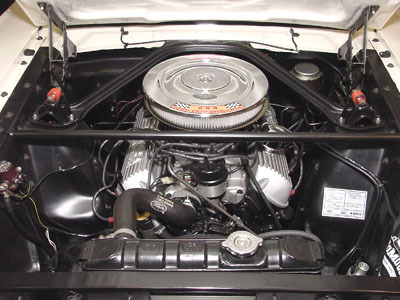 The standard steel hood was replaced with a lighter fiberglass hood, complete with intake hood scoop and was locked into place with special hood pins. 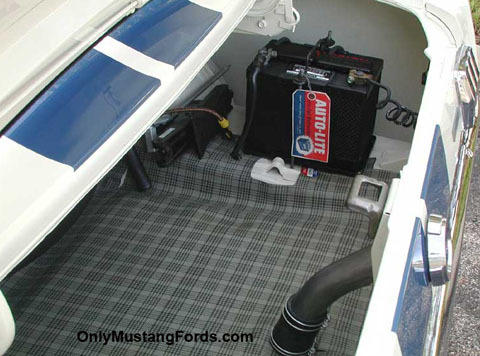 The standard 1965 Mustang lower valance and upper grille were replaced with new units to differentiate the Mustang from the GT350 and give it a decidedly more aggressive look. Most noticeable were the new and very cool, sequential firing tail lights. 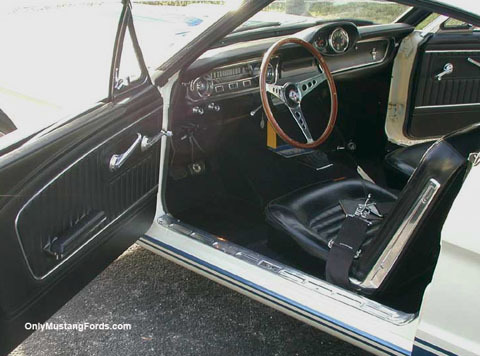 Changes in the 1965 Shelby Mustang compared with the standard Ford Mustang interior included the addition of proper racing seat belts, a center gauge pod on the dash. 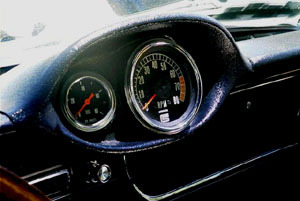 In most cars, the addition of a wood Moto-Lita steering wheel, adorned with the Shelby Cobra logo was added, although a few early cars were supplied with a 16 inch diameter Darrington steering wheel. 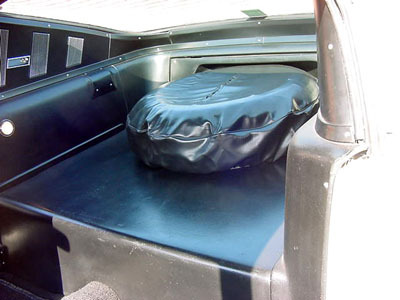 The other most obvious change to the stock 1965 Ford Mustang Fastback interior was the removal of the entire rear seat and it's replacement with a single fiberglass package shelf. Specifications for the 1965 Shelby Mustang was a purpose built, Shelby only engine, which started with the now famous high compression 271 horsepower K-Code 289 cubic inch V8. Shelby added some more of his own massaging of the engine's internals, which included the addition of a high rise intake manifold and a larger cfm Holley carburetor along with the now famous "tri-Y headers" and glasspack mufflers for a strong muscular sound and freer flowing exhaust. These combined efforts allowed the Shelby team to coax output up to a strong 306 horsepower and 329 lbs of torque. Along with the aluminum Cobra valve covers and Chrome air cleaner cover, there's a new cross brace added which bridges the shock towers to stiffen the chassis and improve handling. Starting with the stock suspensions delivered along with the body from the San Jose factory, Shelby cars were fortunate to not receive the stock 4 wheel drum brakes, due to sever fading problems after repeated stops, however the stock disc/drum setup optionally available was not deemed robust enough for the task at hand. 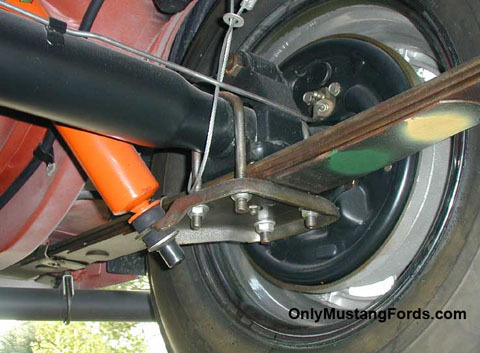 The rear drums in the GT350 were shod with semi metallic friction material and Kelsey-Hayes 4 piston disc brakes and semi metallic pads at the front. As well, while not exactly a suspension change, Of the 562 cars produced, Shelby moved the car's battery from the stock under hood battery tray location to the trunk in most GT350 cars produced from car # 01 to #338 as a method to improve the stock front/rear weight bias. Later units (#339 - #562) carried the typical front mounted batteries. 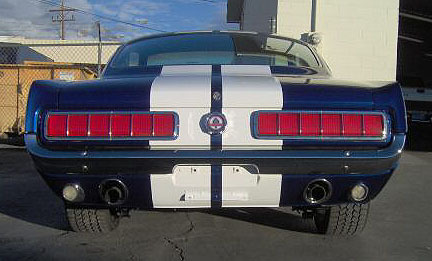 At the rear, in addition to the Bright orange colored Koni's at the rear, the Shelby Mustang team added special traction bars which mounted above the axle and terminated below the rear seat delete cover to keep both rer wheels planted under hard acceleration. So Just How Valuable is a Shelby GT350 Today ? I just finished checking out a rerun show from a few months ago of the Barret-Jackson auction (before Carroll Shelby passed away), which featured a pristine White 1965 GT350 Mustang, which sold for a cool $100.000. You can only guess what these cars will be in future now. Fortunate owners of a 1965 Shelby Mustang are a rare bunch. 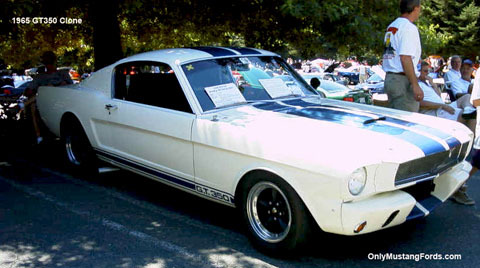 1965 gt350 production numbers totaled only 562 cars. Of these, 34 units were modified for SCCA (Sports Car Club of America) race homologation, as well as the creation of 2 factory race car prototypes, although the requirement was for 100 cars. Shelby was able to bypass the production requirement initially by proving that there were at least vehicles ready for these mods and that the parts were there to be added in time for the January 1, 1965 cutoff. Limited production and a sky high price tag for a "decent" GT350 doesn't mean you can't own your own recreation of the famous Shelby. Due to it's huge popularity you can at least find the parts to convert your 1965 fastback car to a very nice GT350 tribute car. Available pieces include replica fiberglass hoods, scoops, stripes and emblems as well as other interior and engine parts.